1 year after, i revisited Barcelona for this year's Networkers at Cisco Live 2010. This time i focused mostly on training. Hotel         B-   I stayed at a non-Cisco hotel. Buses         -    I didn't use them. Conference    B-   Better than last year's. Center             This time techtorials were made in normal rooms. works near the CCIB, which made projectors in some rooms bouncing. Restrooms were still not enough (or food was too "energetic"). theoretical training, so i didn't choose any labs. something the made the speakers pass it over in quick steps. 10' break and should be made available only in morning hours. session about LISP after a hangover. an unexpected surprise, that proved too informative. available sessions that you have in your interests. Engineer           which proved valuable for one of my issues. in the world of solutions, behind the food area. Food          B+   I didn't try breakfast (i had at the hotel). Lunch had good quality, could have bigger variety. Fruits and desserts were great. Local specialties didn't impress me, so my meals were limited. Snacks        B-   Snacks were average, dessert was good. On-Site Help  B    Is there a taboo with Spanish people speaking English? Cisco Store   A    I bought two books at a 30% discount price. I couldn't find an old one though. Conference    C    Better than last year's plastic bag, but still nothing exceptional. Bags               I used my own bag. Registration  C-   Just the usual session guide and a very small CCIE label pin. Pack               No DVD, no usb stick. CCIE Lounge should have some of these too. Networkers    B-   Too heavy and too large for my netbook. supported. All PDFs should include the session title in their name. all sessions to a single download. World of      -    Like last year, i didn't have time to check it thoroughly. Food at WoS   -    I didn't try it. CCIE Lounge   B    Power stations should have been provided in the CCIE Lounge. Also more lounge chairs would help in certain cases. get some sleep instead (previous night had been too long). CCIE Party    -    Was there one? Customer      C    Although it was a 2-day event, i can't say i enjoyed it. Appreciation       There were 2 live events (one per day), but nothing remarkable. Event              Maybe for locals it was something special. Snacks and food were limited; at least drinks were plenty. Also, it should have started after the end of sessions. Initiative         is more than welcome. Note to Cisco : Next time, please use a single page for everything. Having to flip through www.cisco.com, www.networkersatciscolive2010.com, www.ciscolivevirtual.com for finding the required info can be quite tricky sometimes. Apart from having to keep track of all your login credentials. achievable in hw within 1% of configuration. Cisco documentation is cryptic (as always) about the details of this, but it has to do with some hardware limitation of this specific platform. In particular the granularity of the hardware for the shaping action is somehow based on pre-configured values. The ME-3400 (as most lower end switches) has physical memory buffers, which can be used by IOS only in bunches of specific (pre-configured) sizes. In routers and high end switches, QoS is usually implemented in software through the use of memory pools, which allows the IOS to use parts of buffers with variable sizes. 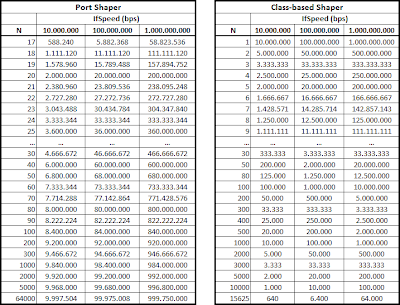 Egress shaping on ME-3400 comes into two categories : Port shaping and Class-based shaping. Port shaping applies to all traffic passing through an interface, while class-based shaping applies to specific classes of traffic leaving an interface. Each one of them is using a different formula in order to give you all the supported values. The result in then rounded up to a multiple of 16. According to the above table, in the port shaper the low end granularity is very coarse and the high end granularity is very dense, while the opposite happens in the class-based shaper. So there is no possibility you can have a <58 Mbps port shaper for 1 Gbps interfaces, as there is no possibility to have <5,8 Mbps port shaper for 100 Mbps interfaces. Similarly you can't have a 700 Mbps class-based shaper on a 1000 Mbps interface, nor a 80 Mbps class-based shaper on a 100 Mbps interface. Let's take for example the following policy-map configuration which is applied on a 1 Gbps interface. QoS: Configuration failed. The configured rate 700000000 bps is not achievable in hw within 1% of configuration. If you check the formula for the class-based shaper (or have a quick look at the table), 930000000 is not actually a valid value to configure, but it gets printed because this is the limit imposed by the parent class. You just have to ignore it. If you need specific values you might want to try changing the speed of the interface : choosing between 10/100/1000 should be easy for BaseTX interfaces, while 100/1000 Mbps SFPs exist for the SFP-based ones. Also, it's strongly recommended that you disable port speed autonegotiation when you attach an output policy map to a 10/100/1000 port, to prevent the port from autonegotiating to a rate that would make the output policy map invalid. Keep in mind that ME-3400E (the new enhanced version of ME-3400) implements a improved version of Egress Shaping Granularity, which uses a simpler linear formula. It's 64 Kbps for the class-based shaper and 100/500/1000 Kbps for the 10/100/1000 Mbps port-based shaper (100 Kbps for 10 Mbps ports, 500 Kbps for 100 Mbps ports, 1000 Kbps for 1000 Mbps ports). Some months ago i was searching for a simple inventory management tool, that could catalogue my company's devices, mainly for updating our support contracts. I tried quite a few of free ones, some demos of commercial ones, but i didn't find what i was looking for. Most of them were bloated with features i didn't need and i had to dig very deeply in order to customize them. So i decided (once more) to write my own. 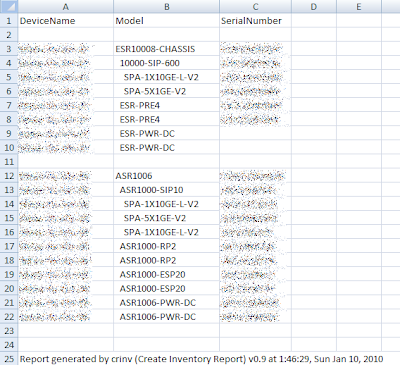 crinv (Create Inventory Report is the full name) is a very simple script written in perl, that produces a csv file containing the most basic attributes you would need from your inventory management tool. Then you can load the csv file in Excel and produce whatever reports you like. crinv takes as an argument a text file where you have to put your devices, one per line. #  - The general format of each line is "device|community"
This will process all devices from devices.txt and use the default community name for devices that don't have one. You can check the included readme.txt for more details. Below you can see screenshots from some generated reports using different display filters (some parts have been intentionally hidden). You can download crinv from here. 1) I have only tested it on Cisco devices and on a limited range of them. If you find it not working on a relatively new Cisco device, please inform me and i'll try to have a look at it. I can't guarantee anything due to my shortage of free time. # always display the correct information. # 6500, 7600, 10000, ASR1000, 12000. # 2950, 2960, ME3400, 3750, 3845, 7200/G1, 7200/G2. 7200s may show a different S/N than the actual one. 2) I don't know if there is a limit on the number of devices that can be processed at once (probably it depends on the hardware perl is running on). On a modest SUN workstation, ~500 devices (~50 of them were modular) were processed without any problem in about 20 mins (snmp is taking the most time). Of course, you can always split your devices in smaller parts and process many different files in parallel. 3) Right now i'm not planning of making it a full-blown application. This was created for servicing my own needs mainly (as many other scripts in my job), but i thought others could benefit from it too.